In 2009 the European Council made the objective for the EU to decarbonise its energy system to at least 80% below the 1990 level by 2050, without affecting general economic growth. A scenario which achieves these goals is the Energy Efficiency scenario in the Energy Roadmap 2050 report by the European Commission. The Heat Roadmap Europe scenario proposed here achieves these same CO2 reduction, but at a lower cost. 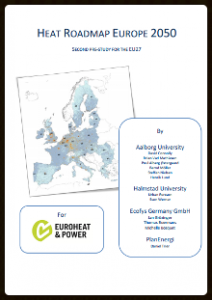 Heat Roadmap Europe 2 is the first study on the EU27 scale which combines geographical mapping of energy demand and supply in unprecedented detail with detailed energy system modelling. Heat Roadmap Europe identifies the potential for using local resources across Europe, and subsequently applies this in the EU27 energy system. Local conditions are considered using geographical information systems (GIS) and combined with hour-by-hour energy system analyses for the EU27, which enables us to find a robust strategy to increase competitiveness, integrate more renewables and reduce the risks in the energy supply. By analysing heat savings and energy efficiency, by investigating local conditions, and by making energy system analyses we are able to identify a balance between heat savings and key infrastructural changes in the energy supply.The results are recommendations for a redesign of the European heat supply. Energy Efficiency: heat savings are a key component in the decarbonisation of the EU energy system. The total heat demand in Europe should be reduced by approximately 30-50%, which is similar to the conclusion presented by the European Insulation Manufacturers Association, Eurima. However, after this point the price of sustainable heat supply is likely to be lower than the price of further heat savings. District Heating: There is currently more heat being wasted in Europe than is required to heat all of the buildings. District heating can capture this excess heat and move it into the buildings. District heating should be increased from today’s level of ~10% up to ~50% in 2050. It should increase in urban areas, where the heat densities have been estimated based on the pan-EU heat atlas. Individual Heat Pumps: in rural areas, individual ground and air-sourced heat pumps should replace existing oil boilers. Heat pumps connect cheap renewable electricity production (such as wind and solar) with efficient renewable heat production (due to their COP). Energy System: heat savings, district heating, and individual heat pumps are key components in a future low-carbon EU energy system. They are fundamental to the technical and economic viability of the Smart Energy System.